Welcome to RaD Car Hire, New Zealand’s longest standing locally owned vehicle rental company. We have a huge range of rental cars to suit every need from zippy little compacts to sedans, station wagons, SUVs, commercial vans and trucks and more. Whether you need a rent a car for work or pleasure, short-term or long term we are here to help. Established in 1987, you can trust that RaD Car Hire will take care of you and your rent a car needs. 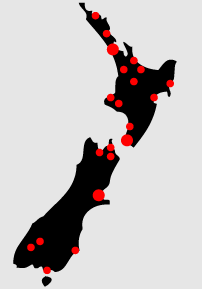 With 21 branches nationwide, all locally owned and operated, we know New Zealand. Summer and Winter packages are available, we can tailor your rental car package for you. Hitting the slopes? Make sure you ask us about ski & snowboard racks for your vehicle. Going camping? Let us know if you need help accessing equipment or want a roof box for extra storage. Have a baby, infant or child? We have clean car seats and boosters for all ages. With each branch tailoring their rental car fleet to meet the needs of their local area and demand, vehicle availability and pricing may vary across the country but you will always find great rates and excellent service no matter where in the network you start your car hire. Check out our RaD Car Hire branches and Our Vehicles under Locations. Then simply get a Quote or Book Now use our obligation free, easy quote system at the top of this page. We have 21 locations around NZ making us one of the largest car rental companies in the country. short term, long term and one way car hire around the country. Our local franchisees will always be happy to assist you in making a booking any time of the year.